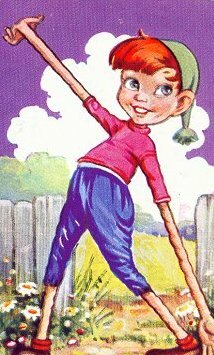 Twizzle was a 'living' boy doll who had the ability to extend his arms and legs to amazing lengths. He drove a red breakdown truck and set about rescuing broken toys. 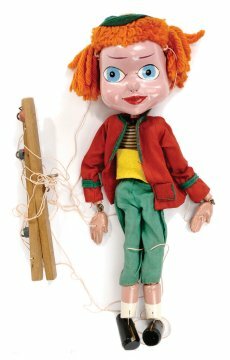 Children's writer Roberta Leigh was the creator of Twizzle, but it was Gerry Anderson and his partner Arthur Provis who bought the doll to life in what proved to be a ground-breaking puppet series. Anderson, who had previously made some television commercials, had been aware that puppets seen on television up to that point were quite grotesque looking and static in as far as eye movements and facial expressions. To compensate, he and Art Director Reg Hill decided to add a number of 'film technique' elements. Details were added to the set and during filming Anderson employed cuts and close-ups, all of which were unheard of in a children's puppet series up to that point. The Adventures of Twizzle was first broadcast on November 13 1957 at 4.30pm. The television series was so well received that Associated Rediffusion wanted another. And toy manufacturers wanted - well, toys. Cautiously though, there were precious few Twizzle toys created. 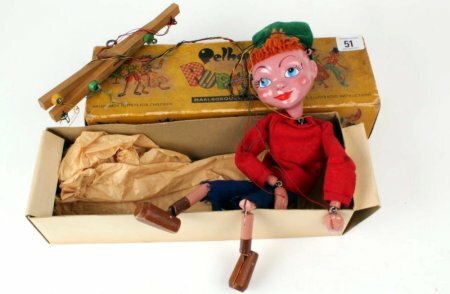 There were records, annuals and card sets, but only one stringed puppet which was made by Pelham. 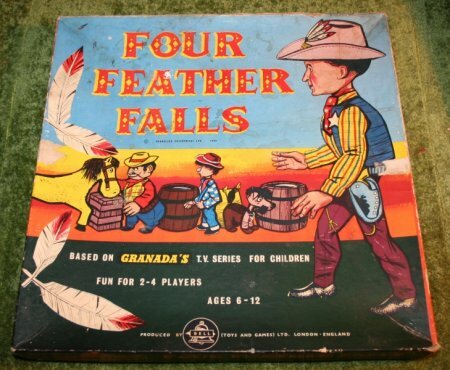 The same was true of Anderson's next series - Torchy the Battery Boy, although merchandising began to pick up with Anderson's third series, a cowboy puppet series called Four Feather Falls. It was Anderson's fourth series that proved to be the turning point. Gerry Anderson had broken away from Roberta Leigh after Torchy, and Four Feather Falls was the first production of his company AP Films. Following the success of the series as well as his impressive CV, Anderson quite naturally expected a commission for another series. Granada Television didn't want one. At this point the Deputy Managing Director of Associated Television, Lew Grade, who was also beginning to build a huge reputation for himself, stepped in and bankrolled Anderson's next project: A series about a futuristic craft that could travel in the air or under the sea - Supercar. When Supercar arrived on British TV screens in 1961 it captured the imagination of its young audience like no other series before it. 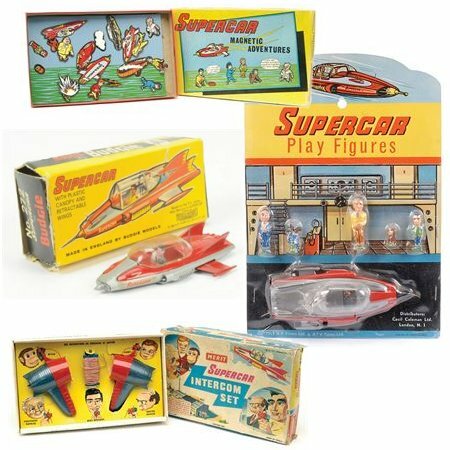 Before you could mutter the word 'merchandise' there were wooden puppets of most of the characters, plastic figures by Cecil Coleman Toys, a 'Supercar Magnetic Adventures' board by Allan Industries Ltd (a painted magnetic board featuring cardboard cut-outs of different characters from the show so you could create your own Supercar adventures at home), a Supercar Intercom Set by Merit, a large friction model of the craft by Fairylite and, most famous of all among collectors, a Budgie diecast model of Supercar (this being very hard to find these days with the front aerial still intact). It was during the production of Supercar that Anderson set up AP Films (Merchandising) Ltd, a separate company set up to handle the licensing of merchandising rights for APF properties and designed purely to cash in on his product. Within three years AP Merchandising could boast retail sales exceeding £750,000. When US President John F. Kennedy, on 25 May 1961, announced before a special joint session of Congress the dramatic and ambitious goal of sending an American safely to the Moon before the end of the decade, a brand new age dawned. Now, instead of wanting to be a cowboy, every child wanted to be a spaceman! Gerry Anderson would cater to this ambition with his next series - Fireball XL5. Set in the year 2063, Fireball XL5 followed the exploits of Colonel Steve Zodiac as he piloted a 300ft rocket propelled spaceship. The series captured the imagination of the public at a time when the space race between the USA and Russia was at its height. Although they'd had a previous hit with Supercar, this was the series that established Gerry Anderson and AP Films as major players in the world of television. Lew Grade sold Fireball XL5 to the NBC network in America where it performed better than anyone had hoped for and as a result the merchandise that accompanied the series reached record sales in the USA for a British made television series. 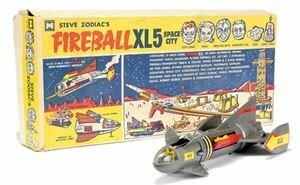 The American company MPC produced 'Steve Zodiac's Fireball XL5 Space City,' a large boxed set measuring over 20 inches long that included an injection-moulded grey plastic XL5 spaceship with a detachable nose cone (Fireball Junior) and spring-loaded rocket launchers. 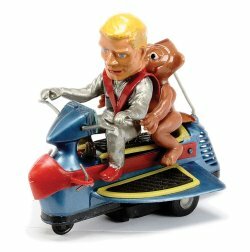 The set also included figures of the main characters Steve Zodiac & Venus and their Jetmobiles. Variations of this set included 'Steve Zodiac's Fireball XL5' and 'Steve Zodiac's Fireball XL5 Galaxy Patrol.' Pelham Puppets once again produced a stringed wooden puppet and there was a plastic model of the rocket that could be thrown into the air to land gently on the ground by a parachute. This was produced by the Italian company Quercerti. One of the harder to find toys these days is Golden Gate's Jetmobile with figures of Zodiac and Zooney. Around the same time toy manufacturers began taking an interest in other television series which didn't have the same space-age feel of the Anderson products. 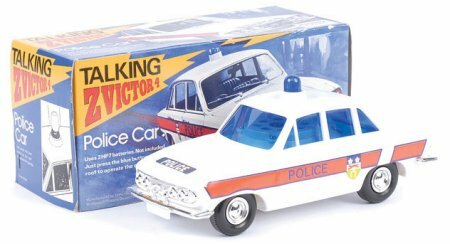 One example was Spot-On Toys' 'Talking Z Victor 4' car - a white Ford Zephyr (the cars driven by the police officers in the BBC police series Z Cars). Then, in 1963, another television phenomenon came along which was to rival the popularity and sales of the Gerry Anderson's tie-in toys. When Doctor Who began in 1963 nobody expected it to capture the imagination of the television watching public quite the way it did. But then again, no one quite expected the Daleks. One of the Twizzle cards that came in a set of all the characters. A comic advertisement for Fireball's parachuting rocket.